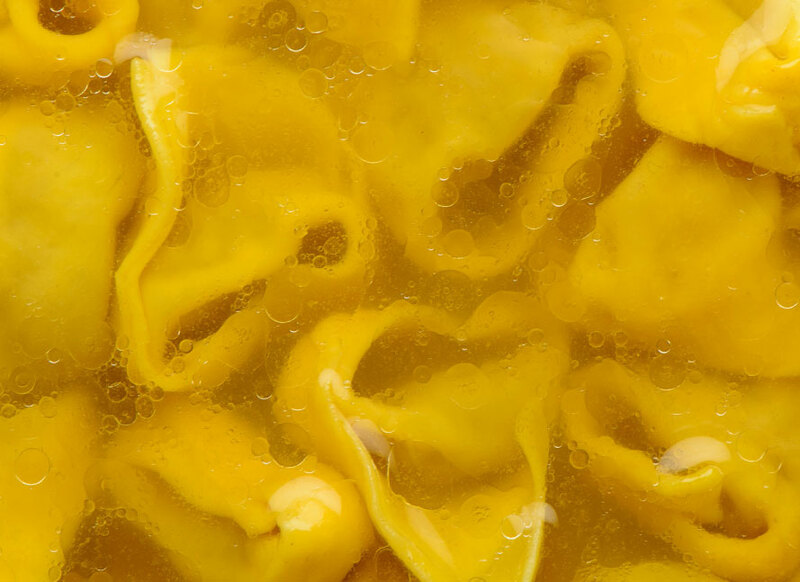 A thin sheet of egg pasta, handled and rolled according to tradition, which embraces a full flavored filling of meat and Parmigiano Reggiano cheese: these are the Tortellini of Modena. Their origins are lost in myth that tells of a cook who wanted to reproduce Venus’ navel as a token of love. What we can say with certainty is that Tortellini is one of the most tasty and inviting products that our city counts amongst its typical specialities. We at the Trattoria Pomposa decided to offer an additional service so you can enjoy a dish of delicious tortellini, prepared fresh daily, at home. So as to preserve their sensory characteristics, taste and freshness intact, the tortellini are placed in a blast chiller and then frozen when ready. Adding them frozen to the boiling broth, the tortellini are ready to be enjoyed with a few minutes. Tortellini are a staple product in our kitchen and are always available, so you can simply come to the Trattoria and order the quantity you would like. If you require very large portions, you can simply call ahead and book them.. They are sold by weight, priced at €35 euro/kg.